Connect MailChimp to your Leadpages account to send leads directly to any of your audiences (lists). Below, you’ll learn how to set up your integration, collect leads, and resolve basic issues you may encounter. You’ll need Manager-level permissions or higher in MailChimp to connect your account. To use MailChimp throughout your Leadpages account, you’ll need to integrate in two different places, as described below. Lists in MailChimp are called audiences. Follow the steps below to connect your MailChimp account to Leadpages. Our integration leverages MailChimp’s API, so you’ll need a key to connect your account. MailChimp has a detailed guide on how to generate a new API key, available here: About API Keys. TIP: We echo MailChimp’s recommendation to generate a unique API key to use with Leadpages. Once you generate or find the API key, copy it and navigate back to your Leadpages account. Drag & Drop Builder: To use MailChimp with our Drag & Drop page builder and pop-ups, follow our integrations setup guide here. Standard Builder: To use MailChimp with our Standard Builder, standalone pop-ups, opt-in texts, and/or trigger links, follow our guide here. All these tools use the same integration system. Congrats, you’ve now connected your MailChimp account with Leadpages! To start sending leads to MailChimp, open the integration settings for your page, site, pop-up, trigger link, or opt-in text, and select the audience where you’d like contacts to end up. More detailed information on how to configure your integration settings can be found here: Choose a Destination for your Leads. To collect information beyond an email address and name, you’ll need to set up additional fields within MailChimp. There are a few ways to do this, which are covered here by MailChimp: Manage Audience and Signup Form Fields. NOTE: If you require a field in MailChimp, it will appear required in Leadpages and not be able to be deleted from the form. After you configure your form within MailChimp, you should see any additional fields appear so you can add them to your form within Leadpages (more information on adding custom fields to a form widget). NOTE: Keep in mind, opt-in texts only supports email and phone number fields, and trigger links support email, first name, and last name. Our forms work with MailChimp audiences that are segmented into groups. To let your subscribers select a group, be sure to add a Groups form field within MailChimp. You can use a drop-down menu, checkboxes, or radio buttons as described here: Create a New Audience Group. Another option is to add subscribers to a pre-selected group. To do so, set your group field to “Hidden”, then choose the default option. As an example, here’s a form in the Drag & Drop Builder for a watch giveaway page. You’ll notice a specific watch color is pre-selected, so any entry will get segmented into that Group in MailChimp. Audiences in MailChimp default to a double opt-in process, so any subscribers must confirm their subscription (via an email link) before they end up on your audience. Using double opt-in has many benefits, including protection against spam. However, you can choose to disable the process when you integrate with Leadpages. If you'd like to bypass your subscribers having to confirm their opt-in, make sure that double opt-in is turned off in both MailChimp and Leadpages. Open the integration settings for any Drag & Drop form. Select MailChimp from Integrations › Add an Integration › More Services. Click the Actionsmore menu for your MailChimp account, then click Toggle Double Opt-In. The option will read (OFF) when disabled, and (ON) when enabled. Click your name in the top-right corner of your account dashboard, then choose Integrations. Click the toggle beside “Double opt-in is …” to switch the option on or off. For detailed steps on getting to integration settings, please see Connect Your Integrations. In 2016, MailChimp announced their decision to no longer support any API versions below v3.0. Our engineers are working on migrating the existing Legacy MailChimp integration to use the new MailChimp v3.0 API. New features are available when using the updated MailChimp API, including lead backup as well as being able to download your opt-ins as a CSV file. NOTE: This does not affect any MailChimp integrations with our Drag & Drop Builder, which already use MailChimp’s more recent API. Create a new MailChimp integration at the account level so that you are connected through MailChimp v3.0 instead of Legacy MailChimp, as seen below. When you create the new integration, you can use any active API key from MailChimp—no need to use a special “3.0” key. For full instructions on finding your API key, see MailChimp’s article here. You can also have the two versions of the MailChimp API connected simultaneously. For each active (Standard) Lead Page, trigger link, pop-up, and opt-in text using MailChimp, you will need to reload the integration options, select “MailChimp v3,” then reload your MailChimp audiences and select one. 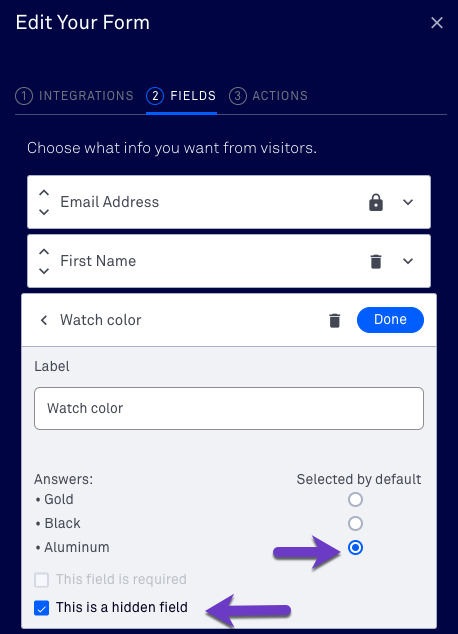 Save the updated integration (either by clicking the green Customize this form or blue Done button in your form’s sidebar settings). We recommend opting in to least one page or pop-up using the MailChimp v3.0 integration to verify everything works as expected. Is there a way to enable Welcome Emails and subscriber notifications when using single opt-in? Instead of a Welcome Email, you can set up an automation for your audience. For instance, you could use one of MailChimp’s audience activity automations. For additional guidance, check out MailChimp’s tutorial: Add an Automation. While MailChimp’s regular subscriber notifications won’t send, you can set up Lead Notifications instead. To learn how, check out: Receive Email Notifications for New Opt-Ins.